AUDIENCE: Pick this one up if you’re after a pleasantly illustrated (a rare boon in this type of books) book on tricks/games to play with your dog on a rainy day. 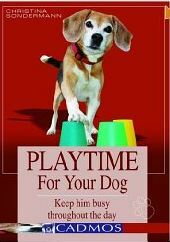 Professional trainers and behaviourists can also use it as a source of inspiration for tricks class or play therapy. REVIEW: I loved that this book was so thorough and well illustrated. It ranges from games using next to no material to the latest brain toys. It is full of really good, original ideas for that rainy day when your dog needs to burn some calories but you can’t get to the park. It suggests games aimed at problem-solving, impulse control, agility, overcoming fears, etc. I recommend it a lot during my behaviour programmes. Browse the Book Review archive. Genre: owner manual. Author: Sondermann Christina. Reading Level: Owners. Star: 3. Bookmark the permalink. Post a comment or leave a trackback: Trackback URL.